Hello and thanks for stopping by our blog. 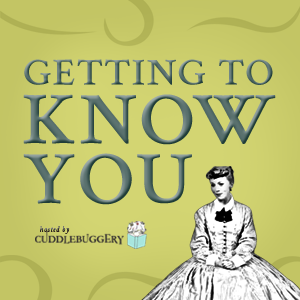 Getting To Know You is a blog hop hosted by Cuddlebuggery and it runs now through midnight on November 29th. There's a slew of bloggers participating so please check them all out. Okay, so who makes up Reader Girls? We began our blog in December 2009 as a way to share our love of reading. When we started there were three of us--our Mom and her two teen daughters. Over time we girls have had to limit our blogging due to school (Meg is now a college sophomore and Caity is a junior in high school and a dancer). Mom does most of the blogging when we're busy and she is trying to get our brother (10) involved with blogging about his favorite books in fifth grade. One of our favorite authors this year has definitely been Jennifer Armentrout. We met her at a Book Rave last September and she was great. Both Mom and Meg love her Dark Elements YA series so we're giving away one copy of the latest book which came out last month. Why the Dark Elements? We love the sass of her main character, Layla, the toughness of demon prince Roth and the dedication of gargoyle Zayne. The second book in this YA paranormal trilogy is filled with action, revelations, mystery, and there's kissing too. Readers get to see what Layla has to endure as she tries to get answers to the crazy stuff stuff going on in her life (you have to read book one, White Hot Kiss) and more. Did we mention the kissing? Who will Layla wind up with in book three? We have our guesses but won't mention them yet. 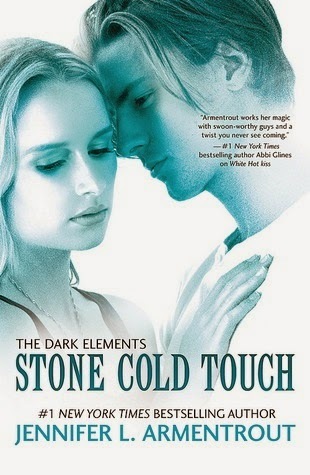 One winner will receive a paperback copy of Stone Cold Touch by Jennifer Armentrout. Our giveaway is open internationally (please make sure the Book Depository ships to your location before entering). Don't forget to stop by the other blogs to meet them and see what they're offering. Have a great weekend! One winner will receive a paperback copy of Stone Cold Touch. Open international. I LOVE Jennifer! I met her once and she was amaze balls. Thank you so much for participating in the blog hop! I love that you guys blog as a mom/daughter/daughter team! My kiddos (Daughter/11 and Son/9) sometimes do book reviews with me on my blog. I'll need to check back to get some good book recommendation for my son if your brother does start blogging with you all! I have this book sitting on my shelf because I preordered it but I haven't read the first yet! I know I will love it because it's JLA and she can do no wrong. Why do I get so behind on my books?!?! But now I am really thinking I need move this book up on my reading schedule. Well the first one because I gotta read that one first!